We love the idea of ‘Grazing’ and ‘Sharing’ Food and we have carefully crafted our family served meals to reflect this. Platters of any chosen food served to the table to be shared. We think that they just help perfectly with the atmosphere at a wedding, especially when all of the guests don’t necessarily know one another. Passing around food encourages the flow of conversation amongst your nearest and dearest! 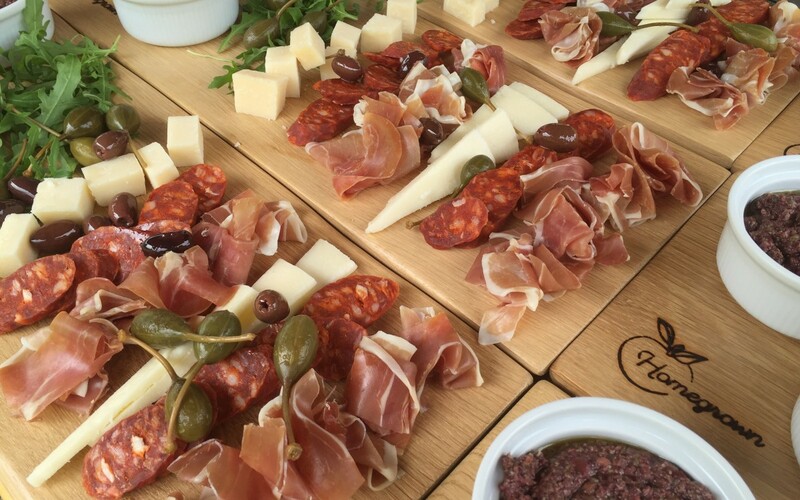 Take a look at this, our sharing Antipasti starter sharing board, one of a number on our menu. This features Parma Ham, Yorkshire Chorizo, Ribblesdale Ewes Cheese and Parmesan as well as our home-made Tomato Confit and home-made Olive Tapenade and we serve with the wonderful Dumouche’s Artisan bread! YUM!!! We get so many ooh’s and aah’s when we bring these to the tables. we also serve desserts in this style. have a look at our menus for more ideas on our sharing options.